When ETANI makes the most of digital technology and makes a generator, this is how it turns out. High performance, reliability and functionality – A totally new signal generator for testing loudspeakers. 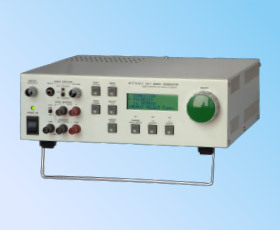 This signal generator utilizes an advanced digital signal processing LSI and a microcomputer technology. It is totally different from the former analog sweep generator and ensures superior reliability, performance and functionality. A new signal generator for loudspeaker testing, featuring rich options that suite various purposes. 2) Load measurement data to spreadsheet programs, etc.